Technical Diving can be (and is) done well, or badly, done intelligently or ineptly- the point is to do it well and intelligently- for so many reasons. Performing technical diving well is not only a matter of acquiring a body of knowledge (knowing 'what'), but is more like playing the piano well; it is as much 'knowing how' as 'knowing what'. The interweb is not the best place for either of these. Think on that. Deep Down Your Training Matters, so Train Right. English, eloquent, experienced- the 3Es of Paul. Despite my boyish good looks, I have been a certified diver since 1984 and an instructor (British Sub Aqua Club Advanced Instructor) since 1990. My early dive training and instruction was on the prolific wrecks in the cold waters of the North Sea and English Channel and since then I have been fortunate to have dived most places around the world including: under thick ice in Norway, the spectacular, deep WW1 and WW2 wrecks of Scapa Flow, the cold, bountiful waters of Puget Sound, spectacular Belizean reefs, deep Red Sea walls, PNG, Panama, Loch Ness, the deep lakes of Germany, cold Baltic waters, plus the extensive caves of Florida and tight caves of UK. 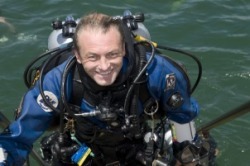 An experienced, independent, multi-agency diver and instructor, I train students up to the very pinnacle of diving achievement, hypoxic gas trimix programmes. My background is that I was an officer in the British Army and I retired as a LTC. Ask me for some war stories if you would like to be bored. I have instructed and certified both military and civilian divers for over two decades. Joint Services Military Shallow Water (O2) Rebreather Diver. Selecting an instructor for your diving education is not something you should take lightly. At all skill levels, especially the technical level, the most important factor is the instructor. However, the agency matters too in terms of the robustness of the training standards- some are just better than others, but it is still your instructor who will make the greatest difference in how much you gain from the courses. Quality is the key. Deep down your training matters, so choose well and train right. Diving is, and should always be, an enjoyable activity at all levels. I provide each student at every level prompt, courteous and thorough instruction. Developing divers to the level of technical or cave diver is, and must be, both rigorous and demanding, yet will be so in a relaxed and enjoyable manner. I will provide the highest quality instruction and the greatest value for money in every class.